Never will John H.C. Davis live far from water. It’s as if coastal sea breezes and salt air and shorebirds do not merely inspire him, but sustain the one-time surfer turned kayaker. Davis spent his early years on an island. He moved from Puerto Rico to New Orleans after his father, an architect, landed a teaching job at Tulane University. Davis would attend Tulane, graduating with a bachelor of fine arts degree, marry and raise a son while living in Pensacola. He then relocated to South Florida (Vero Beach) where he lived for some 17 years and found that his artwork, a reflection of his coastal meanderings, sold especially well. For the past two years, Davis has been back in Pensacola, where he maintains a studio and is at work on a series of big, vertical pieces, about six feet in height, just a foot in width and featuring repeated representations of birds and fish. Davis specializes in woodcuts, a technique that involves carving blocks of wood to create recessed images, rolling the blocks with ink and then pressing the blocks onto paper to produce an image. Davis then paints the images, which are like oversized coloring book pages. At times, Davis uses linoleum as an alternative to wood because it holds up better. For anyone who ever passed through Ocean Springs, Mississippi, Davis’s creations will bring to mind the work of Walter Anderson, whose fascinating and intimate relationship with the Gulf Coast is legendary. Davis is very much aware of Anderson, who got his start painting pieces of pottery in the family business, and counts him as an influence. Kandinsky traded in woodcuts before he moved into the colorful, and at the time radical, work that would lead historians to proclaim him a forefather of abstract expressionist art. Davis’ work remains grounded in reality, in the biosphere. He has a fondness for the creatures he paints. And he knows a fair amount about them. 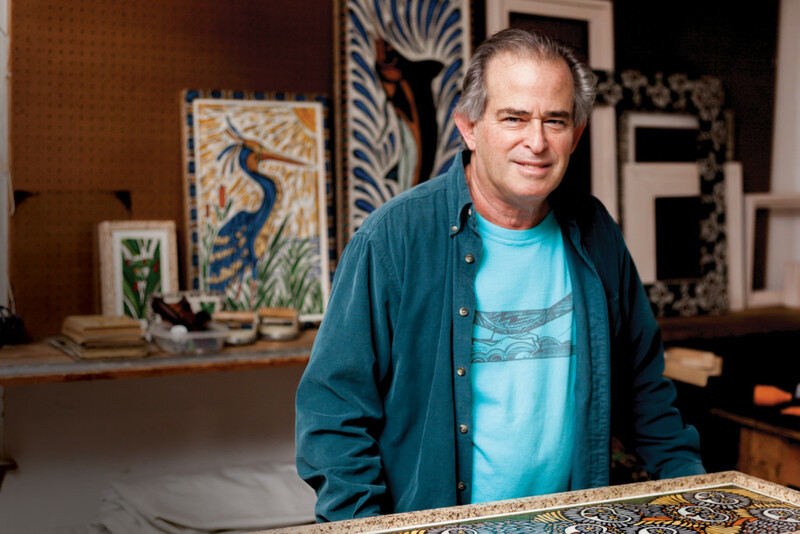 His subjects include the turtles, gators, wading birds and marlins favored by many artists. But, delightfully, he moves beyond the familiar to depict species including skimmers and leopard rays. Davis comes from a family of creators. His mother, now 92, was a painter. He has a brother who, like his father, is an architect. He lives atop a rise in Puerto Rico and specializes in tropical architecture that provides for flow-through ventilation, eliminating the need for air conditioning — it basically means taking out a lot of walls, Davis said. Davis can be an itinerant sort. For 24 years, he has carried his art to shows around the region, and last year, he made the Chain of Parks Art Festival in Tallahassee part of his itinerary. That event impressed Davis and he, as it happens, impressed festival personnel. Davis was unaware that he might qualify to become the Chain of Arts cover artist when, last year, festival officials stopped by his booth. One painting in particular attracted their attention. This year, a Davis palm tree painting will appear on the festival poster, the cover of its program booklet and on event T-shirts. So it was that Sheri Sanderson, the festival’s artist program manager, had occasion to call Davis with some unexpected good news. And so it was that Davis was made glad for having departed from form and depicted a rooted living thing versus one that swims or flies. John H.C. Davis is the cover artist for the 19th annual festival, which will be held April 27 and 28 in parks in downtown Tallahassee. More than 170 artists will display work. 1719 S Co. Highway 393, Santa Rosa Beach, FL 32459 www.eccpharmacy.com, info@eccpharmacy.com Monday–Friday, 9 a.m.–5 p.m.